When enhancing the built environment, attention must be given to the effect on the environment from which the raw materials are drawn. 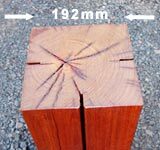 As a result of the historic 1999 agreement between the Queensland State Government, peak environmental bodies and the timber industry, available raw logs are much smaller and of a different grade than prior to 1999. In particular is the difficulty in providing 150x150mm conforming to grade specification timber i.e. free of heart (pith). 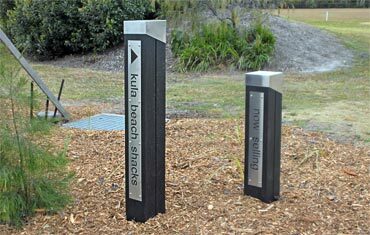 Outdoor Structures Australia’s Pioneer™ Posts allow designers to utilise a readily available and responsible resource. Hardwood of the correct species and grade produces landscaping structures that age gracefully. The sourcing of the required timber is handled by Outdoor Structures Australia in an innovative approach that utilises smaller (correctly profiled) logs. The timber used for this "family" is produced under the South East Queensland Forests Agreement (SEQFA) and guarantees a sustainable ethical supply. The Pioneer™ profile presents an eye pleasing and balanced form. 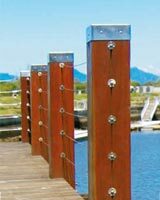 The specialised machinery necessary and the special tooling requirements will limit the potential for alternative (and often inferior) products being substituted for genuine Outdoor Structures Australia "Pioneer"™ Posts. Improved structure - movement at a single expansion groove can be more than anticipated. The three grooves spread the movement over the post. A decorative cast cap can be utilised to enhance the aesthetics. The "Pioneer"™ profile is environmentally sound and uses locally grown hardwoods from the SEQFA resource - the only agreement in place among the government, timber indutry and the environmental bodies. 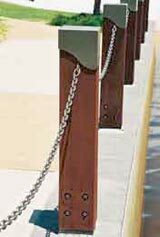 The "Pioneer"™ post uses expansion joints which work in the same manner as those in concrete. The joints are machined with pencil rounded edges to avoid splinters. One plain face allows for routing of signage. 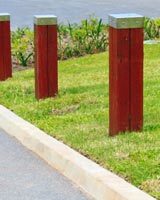 The "Pioneer"™ Post is available in two grades: Bollards (600mm in ground) and Select (full length visible). Fabricated caps are available including in cast aluminiu. See Bollard Caps. Individual designs are most welcome. Design and applications are restricted only by your imagination. Talk to us about integrating the "Pioneer"™ family into your project. Pioneer;™ Post › This two page brochure gives information on Outdoor Structures Australia’s innovative timber products. Pioneer Post™ background › This two page brochure explains the Environmental and Design considerations resulting in the innovation of the Pioneer;™ Post product range.